Shaw was an officer in the Federal Army during the American Civil War who volunteered to lead the first company of black soldiers. Shaw was forced to deal with the prejudices of both the enemy (who had orders to kill commanding officers of blacks), and of his own fellow officers. Taglines: Their innocence. Their heritage. Their lives. Nothing would be spared in the fight for their freedom. The relief sculpture in the credits is the Robert Gould Shaw and 54th Regiment Memorial in Boston Common, by Augustus Saint-Gaudens. Continuity: The Confederate soldier that Trip wrestles with gains a hat just before being clubbed. Title Card: Robert Gould Shaw, the son of wealthy Boston abolitionists, was 23 years old when he enlisted to fight in the War Between the States. He wrote home regularly, telling his parents of life in the gathering Army of the Potomac. / These letters are collected in the Houghton Library of Harvard University. Colonel Robert G. Shaw: Dear Mother, I hope you are keeping well and not worrying much about me. You mustn't think that any of us are going to be killed. They are collecting such a force here, that an attack would be insane. The Massachusetts men passed though here this morning; how grand it is to meet the men from all the States, east and west, ready to fight for their country, as the old fellows did in the Revolution. But this time we must make it a whole country for all who live here, so that all can speak. 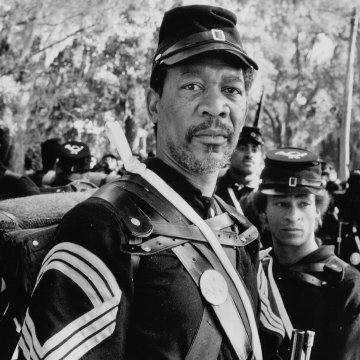 "Glory" is a modern film classic that highlights a little-known chapter of the Civil War. I recently purchased the DVD, and was just as moved (if not more so) as the first time I saw it. Broderick, Freeman, and Washington, along with a stellar cast play it faultlessly. I still remember the brouhaha over the casting of Matthew Broderick as Shaw, and I see that even now some IMDb posters single him out for fault in "Glory." Sorry, but I disagree. One should remember that the real Col. Shaw was a young man in his mid-20s - hardly a grizzled old veteran - despite his high rank. Broderick actually does bear a resemblance to Shaw, and shouldn't be criticized for his boyish looks. I felt every nuance of the burden he carried, and thought Broderick did a wonderful job. 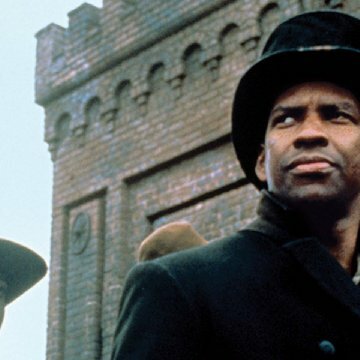 Denzel Washington's powerful acting may never again have a showcase like it did in "Glory." His beauty, rage, and pride scream in every frame. His Oscar for this break-out role was highly deserved. 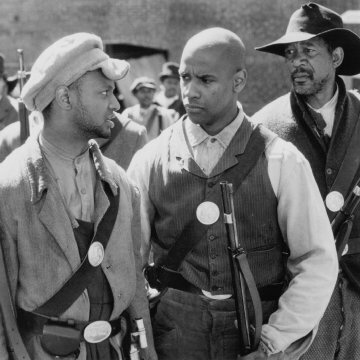 Trip's character is really the distillation of what this film is all about: the black man's heart-rending battle for worth, recognition, and dignity. As far as I'm concerned no one BUT Washington could have played Trip. Thank God for Denzel! 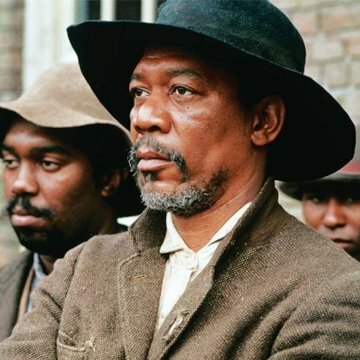 Morgan Freeman is the film's human core. His quiet compassion and leadership keeps the soldiers focused. His one angry confrontation with Trip proves he has the goods to back up a field promotion to Sergeant Major. Freeman (an appropriate reminder of where surnames come from) is the father figure the regiment desperately needs in a time of death and crisis. The men look to him for his calming wisdom and reasonable, fair demeanor. Films like "Saving Private Ryan" raised the technical bar for battle scenes. 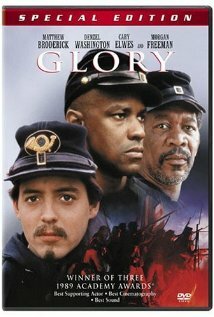 The fighting scenes in "Glory" are, unfortunately, it's weakest element. The staging and choreography are mediocre at best. 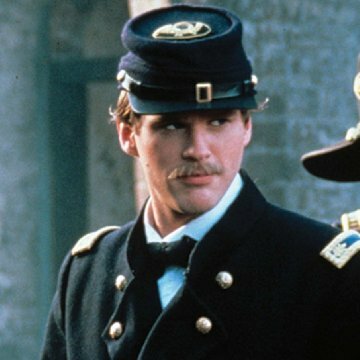 And other than a scene where the 54th Massachusetts is given a hero's flanking onto the battlefield beaches of South Carolina, these shots don't emotionally engage the viewer. Still, in the end, "Glory" isn't about big, noisy battles. It's about the transcendence of the human spirit in the face of bigotry, bad treatment, and almost certain death. It's about a watershed moment in our bloody history that elevated us all and must never be forgotten.